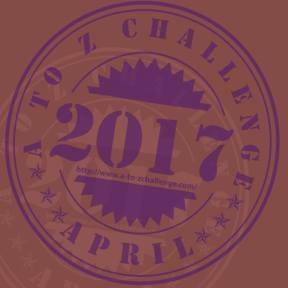 Welcome to the April A to Z of gamebooks 2014! It promises to be a rollercoaster ride through vibrant, inspiring and quickly growing world of gamebooks. And, for those of us who might want to write our own gamebook, or even never thought about writing a gamebook, it may inspire and help you to do so. We kick the Arpil A to Z off with someone who is determined to make gamebook writing easier. Writing gamebooks is not as easy as writing a normal story. There are all those choices and consequences to keep track of. How do you bring all of those story threads together? Well, it is not as difficult as you think when there are people out there making programs to help us create gamebooks. So, first of all, I give you a solution to one of the most common roadblocks to writing gamebooks in the form of Daniel, creator of the Gamebook Authoring Tool (or GBAT) from Crumbly Head Games. 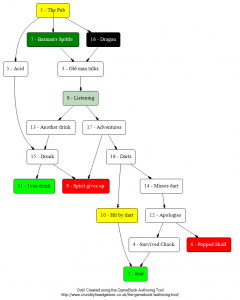 you can download a trial version for free that allows you to arrange a gamebook up to 100 paragraphs into a flow diagram, and then covert it to rtf (very useful for entering the Windhammer Competition). There are many other great features too, that will help. For a small price, you can unblock the 100 paragraph cap and have many other benefits to help you write your gamebooks. It really is an awesome tool, as you never have to go through the drudgery of arranging manual flow diagrams again, or get a paragraph number wrong and mess up your entire gamebook. For more information, and to see reviews of last year's Windhammer entries, have a look at their blog. When I was younger I would read all of the gamebooks I could get my hands on. I just loved the idea of having a book which would change every time you read it. It got to a point where I could only read gamebooks. Attracted by a cool cover, I'd pick up a book from the library and be very disappointed if it wasn't a gamebook, if the text inside of it was linear. And I would write my own gamebooks, sending the readers out on ridiculous and rubbish adventures. And then gamebooks kind of dried out and I moved away from them. I had to move onto boring linear books. And then gamebooks came back. The mobile app market took off and we began to see a lot of very interesting games. Choice of games. Tin man games. I got very excited and back into gamebooks. I decided I would like to write my own gamebook again, but this time to increase my readership beyond just my dad. Like most writers, I had a gamebook in my head that was magnificent in both its scope and ambition. There would be wickedly devious puzzles and terrible enemies. There would be grand adventure and emotional content. You would love the characters and cry if they died. And this time I wouldn't just sit down and bang the whole book out. I would plan this thing. It would make sense. It would be infinitely replayable. So I sat down, opened up my Word document and spreadsheet and didn't know what to do. How did you come up with the idea of writing GBAT? Word processing software exists so people can write documents. Spreadsheet software exists so people can maintain data. It follows that there must be gamebook software to write gamebooks. Fabled Lands exists, which is breathtaking in scope and complexity. 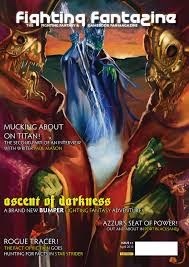 Fighting Fantasy and LoneWolf books would come out every few weeks. There must be techniques and software to help create these kinds of books. I googled the entire internet and asked on forums but I did not get any satisfactory answers. I tried Twine and Advelh which were almost there but the mechanics were too heavy and I always felt like I was clicking too much and could never settle down to write. I was also unsure what they were doing for me. Inkle attacks the problem from the other end; it is all about the writing and it's great, but it's not a planning tool and we sacrifice the ability to see how it all hangs together. I could find nothing which sits in the middle ground. And that was the thing I wanted. People here have painstakingly mapped gamebooks to a format which creates these amazing graphs. I've heard them described brilliantly as "The DNA of gamebooks". I realised this is how I wanted to see my gamebook, but I wanted to see this as I was writing the gamebook and with minimal effort. And so I had a problem. The software I wanted did not exist. As luck would have it, I have been trained as a software engineer and was capable. If I wanted this software, it would be up to me to write it. 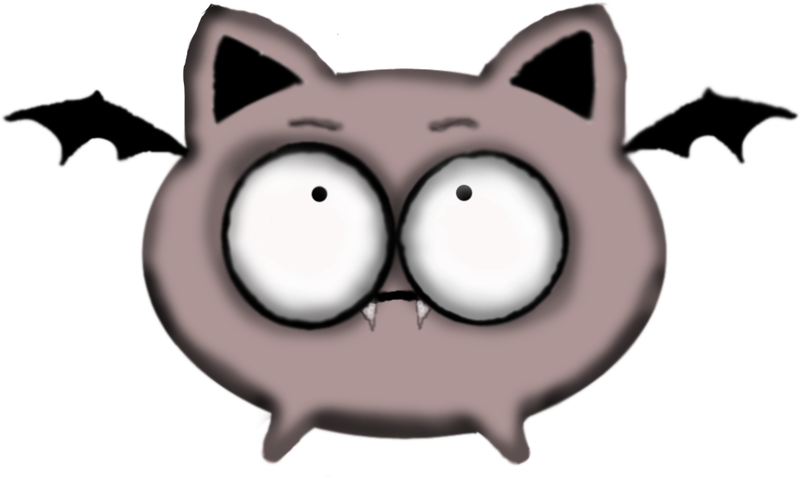 The early versions of GBAT were just meant to be for me and the mystical gamebook I was going to create. 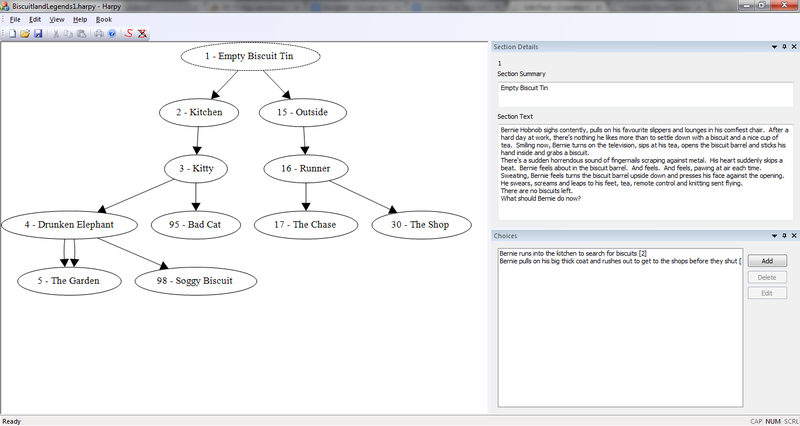 But once I figured out how to generate the graphs behind the words of a gamebook I got a bit excited. I thought if I needed this software then other people might be looking for it as well. The Gamebook Authoring Tool was born, it became my focus and ironically the gamebook got put on the shelf. I think I'm a better software engineer than I am writer, so it's probably better for everyone this way. What features does GBAT have to help gamebook writers? The aim of GBAT is to erode away the barriers of gamebook writing. A multi-branching story is one of the hardest stories you can write. It takes a lot of mental effort and you have to put yourself in the shoes of almost every combination of choices at any part of the story. It's easy to lose yourself. With GBAT it will always be super easy to see the overall layout of your gamebook because this is incredibly useful. Everytime you write a section or create choices and links to other sections this will be reflected in the graph. This picture really helps you see how many branches there are to a particular part of your story. The second biggest challenge I always found was shuffling up the sections in your gamebook. You can create a spreadsheet and randomly assign numbers to columns, but back at the document there's still a labourious cut and paste effort. This is the dullest part of gamebook writing and perhaps the most perilous. One mistake here would break your gamebook and it would be a mistake that is hard to find and hard to fix. Luckily, computers love tedious tasks and GBAT does this part really well. I think this is the feature gamebook authors will benefit the most from. Even professionally written gamebooks have fallen down in these areas. One of the most insightful benefits of the fighting fantasy gamebook graphs is you can see the unreachable areas. The Lone Wolf series republished on project aon comes with a ton of errata. 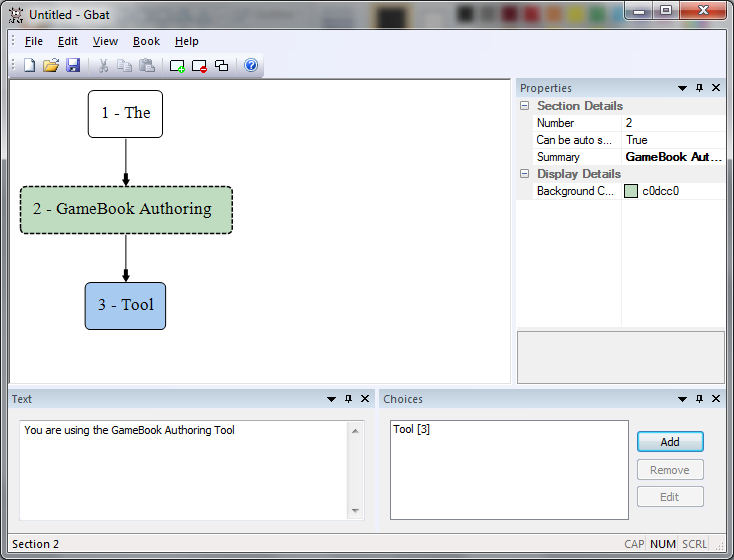 GBAT can solve the genuine problems of gamebook authoring. I had most of the Fighting Fantasy series but the books I truly loved were from the Lone Wolf series. I really enjoyed the continuity between books and how you could create your character with skills so you could tackle problems differently per playthrough. "Flight from the dark" is classic and probably still my favourite, but all of the early books are really exciting. The series settles down to easy mode once you have the summerswerd but during the early books you feel so vulnerable and there is a genuine (and thrilling) sense of danger. The Virtual Reality series is also massively underrated. These are really clever and tightly written books. There's no combat, no randomness, it's just down to your choices. It was also the first time I saw keywords used to create states within your world. The book was aware of your actions! This was revolutionary at the time and opened up a lot of interesting possibilities. Dave Morris took this system to the extreme with the Fabled Lands books, books I enjoyed but were very open ended. Virtual Reality was much more focussed on the story telling and you actually felt part of a real world. Something that distinguishes me from my younger self is I am now a lot more interested in the story, the characters and the writing itself. My impatient younger self would skim read, waiting for a the next choice or the next dice roll, but now I have completely changed. I want to experience and believe in the story. I think gamebooks tread a very dangerous line here. Imagine reading a novel where the hero suddenly dies mid-story, leaving all the plot lines open and the damsel in distress. It wouldn't be a very fulfilling experience. An even bigger crime: imagine a story where the hero was perfect. He never had any selfish motives, no dark past and no ambition other than getting to the end goal. He was devoid of any personality, he was flawless and foible free. Imagine how dull this would be. This is what a gamebook can quickly become. Ironically, what can ruin a gamebook is the very thing that defines it as a gamebook. It puts the reader in the driving seat. It gives the reader choice and dice. And this can kill the story. There can be some delightful ways around this. A recent example is Gunlaw by Nicholas Stillman, where the hero (anti-hero) is indestructible despite silly reader choices and is given a fair degree of autonomy. And we can take another step. Wouldn't it be interesting if the reader was more a director of the world, one who plays the hand of fate? That is, instead of the book ending with the hero dying half way through the town seige, the story would continue, but now the villagers would have to go on without their expected saviour. This may be the more fulfilling story. Likewise, removing full control of a hero from the reader would allow those heroes to have character flaws and hidden ambitions. These are all ingredients of a good book. I enjoy the replayability, seeing the same story pan out differently depending on the choices that I've made. The rarely mentioned "Life's Lottery" by Kim Newman does this exceptionally well. I read all of this year's Windhammer entries and I was blown away by the creativity and ingenuity of them. Gamebooks have come a long way from a generic sword and sorcery monster hack fest. Anything that surprises and thrills me is good to read. What future plans do you have for GBAT? I have pages and pages of ideas for GBAT. Like most things, it's a balance to make sure that they are genuinely useful, they fit into the philosophy and don't add unneeded complexity. Short-term, the release I am working on now, is to focus a little on the actually writing of the gamebook. I've been neglecting the authoring part while the planning part has been taking centre stage. I realised that when you are writing you don't always want to see the graph. The gamebook author wears many hats. There's a time for planning and a time for writing. Now there is a way to expand a node in your graph to open up a lovely big area to write in. There are some really exciting longer term goals. I don't know how much you want to get into the mathematics of gamebooks, but imagine a gamebook with all the words pulled out. All you have are section numbers and underneath this is a list of seemingly random numbers to take you to other sections. This would be a very dull gamebook, but this is essential the gamebook skeleton. 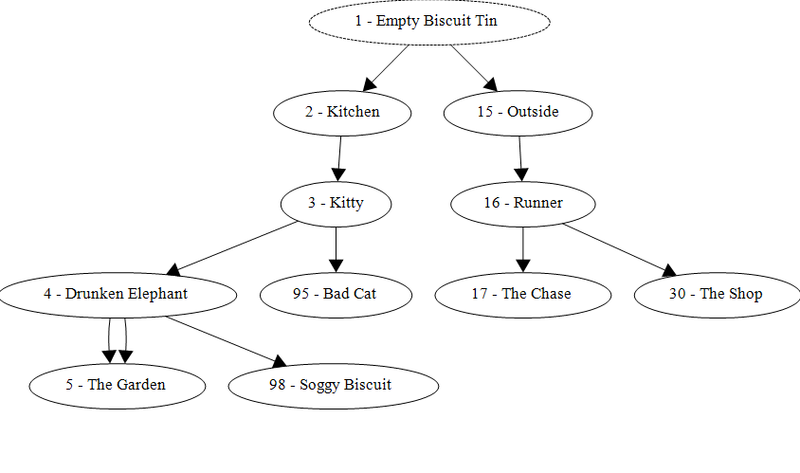 There's also a mathematical term for this: a directed graph. This is how GBAT stores your book internally. What this means is there's a lot of untapped potential we haven't begun to touch yet. Graph theory is a pretty well developed area, and immediate benefits we can get out of it are things like shortest and longest path through your book and the ability to detect unreachable sections. Later, we can also look at making sure any choice at a section is actually a valid choice. A section should not ask if you have a certain item if the item it asks for has had no way of appearing. It shouldn't ask you if you have the harpy feather AND the fish's breath if it's only possible to collect either the harpy feather OR the fish breath. An inkeeper shouldn't charge you 10 coins for a horse if it's only been possible to collect 8 coins up until that point. And things like that. The most important thing of all is I am writing software that I want people to benefit from and enjoy. I do love emails and ideas from gamebook authors so if this is you and you have an idea for GBAT please do let me know about it. For this second coming of gamebooks to ride strong, reach out to new audiences and to have some fantastic adventures on the way. Learn more from Crumbly Head Games.